Can Cops Read Shooter's Sabotaged Computer? WASHINGTON: Acting CIA director Michael Morell said that "Zero Dark Thirty," the Hollywood take on the hunt for Osama bin Laden, exaggerates the importance of information obtained by harsh interrogations. The movie by Academy Award-winning director Kathryn Bigelow tells the story of the decade-long search after September 11, 2001 that climaxed in last year's dramatic and deadly raid in May on the Al-Qaeda terror leader's hideout in Abbottabad, Pakistan. The film shows US personnel using harsh interrogation techniques like water-boarding -- a method widely seen as torture -- to force captives to speak. The information obtained was crucial, according to the movie, in piecing together the trail that eventually led to bin Laden. Not so, Morell said in a message to Central Intelligence Agency employees released to AFP on Saturday. The movie "creates the strong impression that the enhanced interrogation techniques that were part of our former detention and interrogation program were the key to finding bin Laden. That impression is false." Morell's message, sent to the employees on Friday, states that "multiple streams of intelligence" led CIA analysts to conclude that bin Laden was hiding in Abbottabad. He acknowledged that "some" of the information "came from detainees subjected to enhanced techniques. But there were many other sources as well." The controversial techniques were banned in 2009 by President Barack Obama. Morell said that "whether enhanced interrogation techniques were the only timely and effective way to obtain information from those detainees, as the film suggests, is a matter of debate that cannot and never will be definitively resolved." Morell is widely believed to be a top candidate for the job of CIA director after the resignation of David Petreaus, America's most celebrated military leader in a generation. Petreaus stepped down in November after admitting to an extra-marital affair with his biographer. Morell's message, first reported by The New York Times, echoes a statement decrying the "Zero Dark Thirty" interrogation scenes signed by three senators, including Republican John McCain, himself a prisoner of war and torture victim during the Vietnam War. In a letter to the head of Sony Pictures, McCain -- the 2008 Republican presidential candidate -- and Democratic senators Diane Feinstein and Carl Levin wrote that the movie "clearly implies that the CIA's coercive interrogation techniques were effective" in obtaining information that would lead to bin Laden. "We have reviewed CIA records and know that this is incorrect," the senators wrote. "We believe that you have an obligation to state that the role of torture in the hunt for (Bin Laden) is not based on the facts, but rather part of the film's fictional narrative." However two CIA officials active when suspects were tortured disputed those assertions. Jose Rodriguez, who oversaw the CIA's counterterrorism operations when "harsh interrogation" methods were in use, wrote in the Washington Post in April that the path leading to bin Laden "started in a CIA black site ... and stemmed from information obtained from hardened terrorists who agreed to tell us some (but not all) of what they knew after undergoing harsh but legal interrogation methods." And former CIA director Michael Hayden wrote in a Wall Street Journal in June 2011 that a "crucial component" of information that eventually led to bin Laden came from three CIA prisoners, "all of whom had been subjected to some form of enhanced interrogation." Hayden claimed that he learned the information when, in 2007, he was first briefed about pursuing bin Laden through his courier network. But interim CIA director Morell emphasized the film, a likely Oscar contender, "takes significant artistic licence, while portraying itself as being historically accurate." "What I want you to know is that Zero Dark Thirty is a dramatization, not a realistic portrayal of the facts. "CIA interacted with the filmmakers through our Office of Public Affairs but, as is true with any entertainment project with which we interact, we do not control the final product." WASHINGTON (AP) — President Barack Obama has scaled back his ambitions for a sweeping budget bargain with Republicans. Instead, he's calling for a limited measure sufficient to prevent the government from careening off the "fiscal cliff" in January by extending tax cuts for most taxpayers and forestalling a painful set of agency budget cuts. In a White House appearance Friday, Obama also called on Congress to extend jobless benefits for the long-term unemployed that would otherwise be cut off for 2 million people at the end of the year. Obama's announcement was a recognition that chances for a larger agreement before year's end have probably collapsed. It also suggested that any chance for a smaller deal may rest in the Senate, particularly after the collapse of a plan by House Speaker John Boehner, R-Ohio, to permit tax rates to rise on million-dollar-plus incomes. "In the next few days, I've asked leaders of Congress to work toward a package that prevents a tax hike on middle-class Americans, protects unemployment insurance for 2 million Americans, and lays the groundwork for further work on both growth and deficit reduction," Obama said. "That's an achievable goal. That can get done in 10 days." Maybe, maybe not. The latest plan faces uncertainty at best in the sharply divided Senate. GOP leader Mitch McConnell of Kentucky, who wields great power even in the minority, called Friday for Senate action on a House bill from the summer extending the full menu of Bush-era tax cuts. He promised that it will take GOP votes for anything to clear the Senate, where 60 votes are required to advance most legislation. Democrats control 53 votes. Boehner, giving the GOP weekly radio address, said, "Of course, hope springs eternal, and I know we have it in us to come together and do the right thing." Earlier, Boehner said Obama needs to give more ground to reach an agreement and that both he and Obama had indicated in a Monday telephone call that their latest offers represented their bottom lines. "How we get there," he added, "God only knows." Congress shut down for Christmas and Obama flew to Hawaii with his family for the holidays. But both men indicated they'd be back in Washington, working to beat the fast-approaching Jan. 1 deadline with an agreement between Christmas and New Year's. Obama announced his plans after talking by phone with Boehner and meeting with Senate Majority Leader Harry Reid, D-Nev., who had previously pinned his hopes on an Obama-Boehner agreement and is wary of dealing with McConnell. At the White House, Obama projected optimism despite of weeks of failed negotiations. "Call me a hopeless optimist, but I actually still think we can get it done," he said. Boehner spoke in the morning, describing the increasingly tangled attempts to beat the Jan. 1 deadline and head off the perilous combination of across-the-board tax hikes and deep spending cuts. "Because of the political divide in the country, because of the divide here in Washington, trying to bridge these differences has been difficult," Boehner said. "If it were easy, I guarantee you this would have been done decades before." Obama said that in his negotiations with Boehner, he had offered to meet Republicans halfway when it came to taxes and "more than halfway" toward their target for spending cuts. It's clear, however, that there's great resistance in GOP ranks to forging a bargain with Obama along the lines of a possible agreement that almost seemed at hand just a few days ago: tax hikes at or just over $1 trillion over 10 years, matched by comparable cuts to federal health care programs, Social Security benefits and across federal agency operating budgets. Obama said he remains committed to working toward a goal of longer-term deficit reduction to reduce chronic trillion-dollar deficits while keeping tax rates in place for nearly everyone. "Even though Democrats and Republicans are arguing about whether those rates should go up for the wealthiest individuals, all of us — every single one of us — agrees that tax rates shouldn't go up for the other 98 percent of Americans," Obama said, citing statistics associated with his promise to protect household income under $250,000 from higher tax rates. Neither the House nor the Senate is expected to meet again until after Christmas. Officials in both parties said there was still time to prevent the changes from kicking in with the new year. 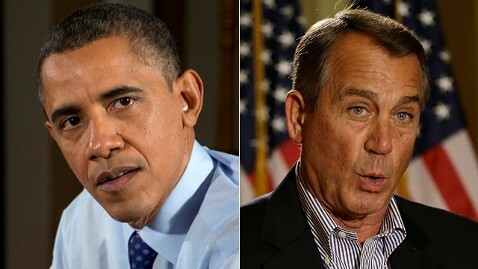 The week began amid optimism that Obama and Boehner had finally begun to significantly narrow their differences. Both were offering a cut in taxes for most Americans, an increase for a relative few, and cuts of roughly $1 trillion in spending over a year. Also included was a provision to scale back future cost-of-living increases for Social Security recipients — a concession by the president that inflamed many liberals..
GOP officials said some senior Republicans such as Rep. Paul Ryan, R-Wis., the most recent Republican vice presidential nominee, opposed the possible agreement. But No. 2 House Republican Eric Cantor of Virginia has joined arms with Boehner. The retreat came after it became clear that too many Republicans feared "the perception that somebody might accuse them of raising taxes," Boehner said. Boehner also said that last Monday he had told Obama he had submitted his bottom-line proposal. "The president told me that his numbers — the $1.3 trillion in new revenues, $850 billion in spending cuts — was his bottom line, that he couldn't go any further." For years, voices have cried in the urban wilderness: We need to talk about gun control. Yet the guns blazed on. It took a small-town slaughter for gun control to become a political priority. Now, decades' worth of big-city arguments against easy access to guns are finally being heard, because an unstable young man invaded an elementary school in Newtown, Conn., with a military-style assault rifle and 30-bullet magazines. Twenty young children and six adults were slain. President Barack Obama called the tragedy a "wake-up call." Vice President Joe Biden met Thursday with Obama's cabinet and law-enforcement officers from around the country to launch a task force on reducing gun violence. Lawmakers who have long resisted gun control are saying something must be done. Such action is energizing those who have sought to reduce urban gun violence. Donations are up in some places; other leaders have been working overtime due to this unprecedented moment. The moment also is causing some to reflect on the sudden change of heart. Why now? Why weren't we moved to act by the killing of so many other children, albeit one by one, in urban areas? Certainly, Newtown is a special case, 6- and 7-year-olds riddled with bullets inside the sanctuary of a classroom. Even in a nation rife with violence, where there have been three other mass slayings since July and millions enjoy virtual killing via video games, the nature of this tragedy is shocking. But still: "There's a lot of talk now about we have to protect our children. We have to protect all of our children, not just the ones living in the suburbs," said Tammerlin Drummond, a columnist for the Oakland Tribune. In her column Monday, Drummond wrote about 7-year-old Heaven Sutton of Chicago, who was standing next to her mother selling candy when she was killed in the crossfire of a gang shootout. Also in Chicago, which has been plagued by a recent spike in gun violence: 6-year-old Aaliyah Shell was caught in a drive-by while standing on her front porch; and 13-year-old Tyquan Tyler was killed when a someone in a car shot into a group of youths outside a party. Wrote Drummond: "It has taken the murders of 20 babies and six adults in an upper-middle class neighborhood in Connecticut to achieve what thousands of gun fatalities in urban communities all over this country could not." So again: What took so long? The answers are complicated by many factors: resignation to urban violence, even among some of those who live there; the assumption that cities are dangerous and small towns safe; the idea that some urban victims place themselves in harm's way. In March, the Children's Defense Fund issued a report titled "Protect Children, Not Guns 2012." It analyzed the latest federal data and counted 299 children under age 10 killed by guns in 2008 and 2009. That figure included 173 preschool-age children. Black children and teens accounted for 45 percent of all child and teen gun deaths, even though they were only 15 percent of the child/teen population. "Every child's life is sacred and it is long past time that we protect it," said CDF president Marian Wright Edelman in the report. It got almost no press coverage — until nine months later, when Newtown happened. Tim Stevens, founder and chairman of the Black Political Empowerment Project in Pittsburgh, has been focusing on urban gun violence since 2007, when he said Pennsylvania was declared the worst state for black-on-black violence. LONDON: Hugh Grant has accepted a "substantial sum" from Rupert Murdoch's British tabloid publisher over phone hacking by the News of the World, the British actor's lawyer said on Friday. The "Four Weddings and a Funeral" star will donate the damages to the Hacked Off campaign against press intrusion. "My aim has always been to ensure that cash is redistributed from Mr Murdoch to help those his company has harassed," Grant said in a statement through the campaign group. His lawyer Mark Thomson said the damages would be transferred to Hacked Off as soon Grant, 52, receives the payment, with a statement made in open court in the New Year. "Hugh Grant has today settled his claims for damages and other legal remedies arising out of the unlawful activities of News of the World journalists and others over a number of years," Thomson said in a statement. "News Group Newspapers (NGN) have agreed to pay him a substantial sum by way of damages. He has instructed us to donate all of his damages plus an additional payment from him to the Hacked Off campaign for a free and accountable media." Grant, one of the most high-profile celebrity victims of phone-hacking by the News of the World, has become a vocal campaigner for press reforms since media baron Murdoch was forced to close down the 168-year-old tabloid weekly over the scandal in 2011. Revelations that the newspaper's staff accessed the voicemail messages of a murdered schoolgirl, as well as dozens of celebrities, politicians and sport stars, had prompted a wave of public disgust. The scandal sparked a judicial inquiry into press ethics and three police investigations. NGN has since paid compensation to dozens of people, including actors Jude Law and Sienna Miller, footballer Ashley Cole and former deputy prime minister John Prescott. A Hacked Off spokesman said: "At the outset of his legal action, Hugh Grant announced that any damages would be going to Hacked Off to be spent on providing support for victims of phone hacking and other press abuse, especially those who don't have access to expensive lawyers. "Mr Grant is one of a growing list of donors who are helping to ensure that the campaign is well-funded for the battle ahead, and can continue to represent people who would otherwise be without a voice in the debate." Hacked Off is campaigning for the recommendations of judge Brian Leveson's inquiry into press ethics to be implemented in full, including a new independent regulator with statutory backing. WASHINGTON (AP) — President Barack Obama says he is "ready and willing" to get a big package done to deal with the "fiscal cliff" and says there's no reason not to protect middle-class Americans from tax increases. Obama says he spoke Friday with House Speaker John Boehner and met with Senate Majority Leader Harry Reid. He says Congress should pass a plan to extend tax breaks for the middle class and extend unemployment benefits. Obama says no one can get 100 percent of what they want and there are "real consequences" to how they deal with the across-the-board tax increases and steep spending cuts scheduled to kick in Jan. 1. Economists fear the combination could deliver a blow to the U.S. economy. Gun control advocates slammed the National Rifle Association today for its proposal to create a force of armed security guards at schools across the country as a response to the Connecticut school shooting. "It is beyond belief that following the Newtown tragedy, the National Rifle Association's leaders want to fill our communities with guns and arm more Americans," Sen. Frank Lautenberg, D-N.J., said. Criticism mounted after the NRA addressed for the first time last week's school shooting in Newtown, Conn., in which Adam Lanza, 20, used a semiautomatic weapon to open fire on students and teachers at Sandy Hook Elementary School, killing 26 at the school. NRA spokesman Wayne LaPierre this morning dismissed the notion that the pro-gun group of about 4 million members would support any kind of gun-control laws, instead saying that "the only thing that can stop a bad guy with a gun is a good guy with a gun." Rep. Chris Murphy, D-Conn., who represents the district encompassing Newtown, reacted angrily to the comments after attending the funeral of another victim from last Friday's massacre. "Walking out of another funeral and was handed the NRA transcript. The most revolting, tone deaf statement I've ever seen," @ChrisMurphyCT tweeted. LaPierre argued that the answer to gun violence in schools is an armed security force that can protect students, made up of trained volunteers stationed at every school across the country. "It's not just our duty to protect [our children], it's our right to protect them," LaPierre said at a news conference. "The NRA knows there are millions of qualified active and reserved police, active and reserve military, security professionals, rescue personnel, an extraordinary corps of qualified trained citizens to join with local school officials and police in devising a protection plan for every single school." He was interrupted twice by protestors who stood in front of LaPierre's podium holding signs and shouting that the NRA "has blood on its hands" and that the NRA is "killing our kids." The protestors were eventually escorted out of the room. Lautenberg, who has introduced legislation that would ban large-capacity ammunition magazines, called the NRA "irresponsible." "The NRA points the finger of blame everywhere and anywhere it can, but they cannot escape the devastating effects of their reckless comments and irresponsible lobbying tactics," Lautenberg said. Mark Kelly, a former NASA astronaut and husband of former congresswoman Gabrielle Giffords, who was shot in Arizona, said, "The NRA could have chosen to be a voice for the vast majority of its own members who want common sense, reasonable safeguards on deadly firearms, but instead it chose to defend extreme pro-gun positions that aren't even popular among the law-abiding gun owners it represents." The Violence Policy Center, a gun-control advocacy organization, said the NRA's idea of arming security guards at schools would not stop school violence. "The NRA plan, which cynically allows for the continued sale of the assault weapons and high-capacity ammunition magazines marketed by its gun industry corporate donors, has already been tried, and it did not work," the group said in a statement released today. It pointed to the mass shooting at Columbine High School in 1999, in which two armed police officers were at the school when Eric Harris and Dylan Klebold opened fire. The officers exchanged gunfire with the killers, but were unable to stop them from their rampage. House Minority Leader Nancy Pelosi conceded that the issue is "complicated, but she said the NRA's call for an escalation "is not a positive force" in the renewed gun-control debate. "For the NRA and others to sort of shield themselves by saying it's the mentally ill or something, and therefore we have to have more armed cops in the schools or more guns in the school -- what are they -- are they going to have [a gun] on the teacher's desk?" Pelosi wondered. "'Wait a minute, man with a gun; I have it locked up someplace. Wait until I go get it.' I mean, this ... just doesn't make sense; we've got to reduce violence." LaPierre had dismissed the notion that banning so-called assault weapons or enacting gun-control laws would stop school violence. He instead cast blame for gun violence in schools on violent entertainment, including video games, and the media. "How many more copycats are waiting in the wings for their moment of fame from a national media machine that rewards them with a wall of attention they crave while provoking others to make their mark?" he asked. LaPierre announced that former U.S. congressman Asa Hutchinson of Arkansas would lead the NRA's effort to advocate for school security forces. Hutchinson specified that the NRA, with about 4 million members, is calling for volunteers to act as the armed guards, rather than requiring funding from local or federal authorities. "Whether they're retired police, retired military or rescue personnel, I think there are people in every community in this country who would be happy to serve if only someone asked them and gave them the training and certifications to do so," Hutchinson said. NRA leaders have held off on interviews this week after refusing to appear on Sunday morning public affairs shows. They said they would grant interviews beginning next week to discuss their position. NRA News anchor Ginny Simone said Thursday that in the wake of the Sandy Hook shooting, membership surged "with an average of 8,000 new members a day." New York City Mayor Michael Bloomberg has said the NRA is partially to blame for the tragedy. "We're not trying to take away your right to advance the interests of gun owners, hunters, people who want to protect themselves," Bloomberg told "Nightline" anchor Cynthia McFadden in an interview Thursday. "But that's not an absolute right to encourage behavior which causes things like Connecticut. In fact, Connecticut is because of some of their actions." The guns used in the attack were legally purchased and owned by the shooter's mother, Nancy Lanza, whom Adam Lanza shot to death before his assault on the school. In the aftermath of the shooting, many, including Bloomberg, have called for stricter regulations on the type of weapons used in this and other instances of mass gun violence this year. Sen. Dianne Feinstein, D-Calif., has said she intends to introduce a bill banning assault weapons on the first day of next year's Congress -- a step the president said he supports. The shattered remains of a high-profile space rock are oddly low in organic materials, the raw ingredients for life. The discovery adds a slight wrinkle to the theory that early Earth was seeded with organics by meteorite impacts. In April a van-sized meteor was seen streaking over northern California and Nevada in broad daylight. The fireball exploded with a sonic boom and sprayed the region with fragments. Videos, photographs and weather radar data allowed the meteor's trajectory to be reconstructed, and teams quickly mobilised to search for pieces in the foothills of the Sierra Nevada in northern California. Researchers readily identified the meteorites as rare CM chondrites, thought to be one of the oldest types of rock in the universe. "Because the meteorites were discovered so freshly, for the first time we had a chance to study this type of meteorite in a pristine form," says Peter Jenniskens of the SETI Institute in Mountain View, California, who led the search effort and the subsequent study of the space rocks. Jenniskens personally found a fragment in a parking lot, where it remained relatively free of soil contaminants. "That's the best you could hope for, other than landing in a freezer," says Daniel Glavin of NASA's Goddard Space Flight Center in Greenbelt, Maryland. CM chondrites make up only about 1 per cent of known meteorites. Most of them contain plenty of organic materials, including amino acids, the building blocks of life on Earth. Jenniskens and colleagues found that the California fragments also have amino acids, including some not found naturally on Earth. But in three rocks collected before a heavy rainstorm, which bathed the other pieces in earthly contaminants, organics are less abundant by a factor of 1000 than in previously studied CM chondrites. These three rocks could not have lost organics due to space "weathering": analysis of the meteorites' exposure to cosmic rays suggests the original meteor was flying through space for only about 50,000 years before hitting Earth. Based on its trajectory and its relatively short flight time, Jenniskens thinks the meteor can be traced back to a family of asteroids dominated by 495 Eulalia, a group known as a possible source of CM chondrites. It is probably a piece that broke off during an impact, revealing the relatively pristine material inside. So what happened to its organics? Jenniskens' team found that the meteorites are breccia – smaller rocks cemented together – which suggests that the asteroid from which they came took a series of beatings. Those impacts, or possibly other processes inside the asteroid, could have heated it enough to destroy most organic material. The result might have implications for the organics delivery theory, says Bill Bottke of the Southwest Research Institute in Boulder, Colorado. "It shows that not all asteroids can deliver sufficient quantities. One of the disappointments is that, from a prebiotic organic chemistry perspective, it was very limited," says Bottke. "But this is an unusual case. Most [CM chondrites] are loaded with organic compounds." Still, studying the space rocks will help us prepare future missions to asteroids such as OSIRIS-Rex, scheduled to take off for asteroid 1999 RQ36 in 2016 and bring a sample back in 2023. "In some ways, we've had a sample, a very fresh one, come to us," says Bottke. "This is a test bed for the techniques we'll use in that mission." LONDON: Prime Minister David Cameron on Thursday paid a pre-Christmas visit to British troops serving in Afghanistan, insisting that the "high price" paid by servicemen had been worthwhile, his office said. Cameron told reporters that Afghan security forces were "doing better than expected" as he defended plans for the British force to be cut to 5,200 next year, according to his office. The premier, who was touring Camp Bastion in Helmand Province, said he was confident that the draw-down of nearly half of British troops, announced in parliament on Wednesday, would not pave the way for an increase in terrorist activity. "The fact is they (Afghan security forces) are doing better than expected," he said. "This is withdrawal. This is draw-down based on success, not on failure." He added that the move was "being done for good military reasons and it has been done in a proper way. "We're confident it can be done while making sure Afghanistan does not return to become a haven of terrorism which is of course why we came here in the first place," stressed the prime minister. Britain has the second largest force in Afghanistan after the United States and has lost 438 troops in Afghanistan since the operation began to topple the Taliban in October 2001 following the 9/11 attacks. Brigadier Bob Bruce, commander of Task Force Helmand, backed the prime minister's comments, saying standards had "risen markedly" over the last year. "The Afghans working with us now really are in control," he told the BBC. "The insurgency is still there. It's not gone but it doesn't dictate things." Cameron joined in a carol service and played table-football with soldiers during Thursday's flying visit. He also announced 230 million in extra funding for equipment. This will go toward providing additional Improvised Explosive Device (IED) detectors, more military working dogs and an upgrade to armoured vehicles. The leader claimed that Afghanistan was now a "far better place than it was when we came here in 2001", but admitted it remained a "deeply challenged country". "We have paid a very heavy price but I think the reason for coming here in the first place, which was to stop Afghanistan being a haven for terror... I think it was the right decision," he explained. He said on Wednesday that there was no final decision on how many troops would stay in Afghanistan after the end of combat operations in December 2014 but said some would remain to help return equipment to Britain and to deal with logistics. Britain would also honour its commitment to help set up an officer training academy for the Afghans, as well as contributing military assistance and aid programmes, he added. The US military currently has about 66,000 troops on the ground as part of a NATO-led force of roughly 100,000. WASHINGTON (AP) — In their "fiscal cliff" standoff, President Barack Obama wants to raise taxes by about $20 billion a year more than House Speaker John Boehner. The president wants the government to spend about that much more yearly than Boehner does, too. That's real money by most measures. Yet such numbers are barely noticeable compared to the $2.6 trillion the government is projected to collect next year, and to the $3.6 trillion it's expected to spend. As the "cliff" approaches — economy-shaking tax increases and spending cuts that start hitting in early January unless lawmakers act first — each side says the other isn't being serious enough about trimming federal deficits. But their inability so far to strike a compromise underscores that their problem is more than arithmetic — it's also about the difficult politics that Democrat Obama and Republican Boehner face when it comes to lining up votes. Chastened by Obama's re-election, Boehner has violated a quarter-century of Republican dogma by offering to raise taxes, including boosting income tax rates on earnings exceeding $1 million annually. Eager for a budget deal that would let him move on to other issues, Obama in turn would cut the growth of Social Security benefits, usually off-limits to Democrats. He also would impose tax increases on a broader swath of people than millionaires — those with incomes over $400,000. But that figure, too, is a retreat from what he campaigned on: the $200,000 income ceiling on individuals and $250,000 on couples. That means both men have angered lawmakers and staunch supporters of their respective parties, just when the need to retain that support is crucial. "When you walk into a room and represent a group and you have to give ground to get a deal, you have to stay in that room as long as you can and you have to walk out with blood on your brow," said Joseph Minarik, research director for the Committee for Economic Development and a veteran of grueling budget talks as a former Clinton White House and House Democratic aide. "Otherwise, the people outside the room don't believe you've fought hard for them." With no quick resolution in sight, Boehner worked Thursday to push a backup bill through the House that would raise taxes on people earning at least $1 million but not on those earning less. A separate bill would replace across-the-board cuts in defense and domestic programs with cuts in Obama's health care overhaul and other specified programs. Economists say the tens of billions of dollars separating the president and speaker are relatively minuscule, especially when compared to the size of the U.S. economy, which exceeds $15 trillion a year. "It's not vanishingly small, but it is minor," said Alan D. Viard, a tax scholar at the conservative American Enterprise Institute. "It certainly would be a disappointment if that minor of a gap would end up blocking an agreement." Even though Obama's and Boehner's dollar differences are small, one hindrance to a deal could be the symbolic political consequence of retreating on their numbers, even just by a little. For Boehner to add, say, another $100 billion to the tax increase over 10 years could well mean that people with incomes well below $1 million a year would get a tax increase, something he wants to limit. On the other hand, adding $100 billion more in spending cuts could mean a deeper hit than Obama wants to Medicare. The president prefers to limit Medicare cuts to the reimbursements that doctors and other health care providers receive, but ever deeper cuts could mean more doctors would be likely to stop treating Medicare patients — an outcome Democrats don't want. None of this means there aren't real budget differences between Democrats and Republicans. Obama says he's proposed raising taxes by $1.2 trillion over the coming decade by boosting the current top 35 percent rate to 39.6 percent for income over $400,000, plus other increases on the highest earning Americans. He's also offered about $1.2 trillion in spending cuts over 10 years, including $400 billion from Medicare and Medicaid, the health care programs for the elderly and poor whose defense Democrats consider precious priorities. Boehner has offered about $1 trillion in tax increases and about the same amount in spending savings. An earlier Boehner offer included $600 billion in Medicare and Medicaid savings — well more than Obama — but it's unclear whether the speaker is still seeking that figure. Because of a dispute over how some savings are classified, Boehner says Obama's offer is really $1.3 trillion in higher taxes and only about $850 billion in spending cuts. The House speaker says Obama's offer is not balanced because its new taxes and spending cuts are unequal. And he complains it does too little to control fast-growing benefit programs like Medicare, a chief driver of the federal government's mushrooming deficits. "The real issue here, as we all know, is spending," Boehner said Thursday. "You go through all these discussions, I don't think the White House has gotten serious about the big spending problem the country faces." The two men's differences work out to $200 billion over 10 years in taxes, and about the same in spending, depending on whose numbers are used. Either way, their gap is less than 1 percent of the money the government will spend and tax anyway. "They're a couple hundred billion apart. This is absolutely senseless," said Senate Majority Leader Harry Reid, D-Nev., insisting Boehner should compromise. "These are gyrations I've never seen before." Obama wants several billion dollars in infrastructure spending to goose the economy and to extend expiring unemployment benefits. He also wants the government's authority to borrow money extended for two more years — until after the 2014 congressional elections — with Congress having little more than symbolic opportunities to block it, a year longer than Boehner has offered. Even so, the numbers being proposed by Obama and Boehner are so close, and the political risks both men have taken on taxes and Social Security benefits are so stark, that many consider it almost unthinkable that they would not eventually complete a deal. "Having come out of their trenches, they either have to shake hands or get shot, maybe by their own troops," said Robert Bixby, executive director of the nonpartisan Concord Coalition, an anti-deficit group. Let’s deconstruct the two parts of that thinking. Boehner and Obama really aren’t that far apart? The differences are more significant than just tax rates. Republicans say the Democratic offer is really $800 billion in spending cuts and $1.3 trillion in tax increases. That is because the inflation adjustment applies to tax rates* as well as Social Security — resulting in less than $100 billion in added tax revenues. Democrats count that as a spending cut. Republicans say that is a tax hike. So the real difference, from their perspective, is $450 billion. The $400,000 vs. $1 million threshold for tax rates hikes is just one part of this. Republicans want more spending cuts and fewer tax increases. Obama and Senate Democrats are fond of saying they are this close (fingers close together). They say Boehner should just accept the president’s offer. But, as I asked Senate Majority Leader Harry Reid, D-Nev., earlier today: If you are this close why not just accept Boehner’s offer? He dodged, saying that Boehner’s offer wasn’t really an offer and likened him to Lucy and the football — you’ll recall the routine in which the “Peanuts” character would pull away the ball at the last second and leave Charlie Brown kicking at nothing but air. Both sides like to talk about Lucy and the football, but that is another story. Will there be a deal? They should be able to do a deal. I know where the deal should be. So do you. But, really, they aren’t quite as close as the nifty charts like this one from the Washington Post suggest. And this is about much more than the $400,000 tax-rate threshold. *By lowering the government’s calculation for inflation, the income level for the top rates would rise at a slower rate, putting more and more people into the top rates. Forget toolmaking, think fisticuffs. Did evolution shape our hands not for dexterity but to form fists so we could punch other people? That idea emerges from a new study, although it runs counter to conventional wisdom. About the same time as we stopped hanging from trees and started walking upright, our hands become short and square, with opposable thumbs. These anatomical changes are thought to have evolved for tool manipulation, but David Carrier at the University of Utah in Salt Lake City has an alternative explanation. He says there are several possible hand shapes that would have allowed greater dexterity, making it less clear why we ended up with the hands we have. But only one hand shape lets us make a fist with a thumb as buttress. Among primates' hands, ours is unique for its ability to form a fist with the thumb outside the fingers. The fingers of other primates' hands are too long to curl into their palms, and their thumbs are too short to reach across the fingers. So when apes fight, they are far more likely to wrestle or hold their opponent down while others stomp on him, says Carrier. To test the importance of fists, Carrier and his colleagues recruited 10 athletes and measured how hard they could hit a punching bag using a normal fist, a fist with the thumb stuck out, and with an open palm. The athletes could generate more than twice the force with a normal fist as with the thumb-stuck-out fist, because of thumb's buttressing role. There was no difference in the force they could generate with a normal fist and with an open palm, but Carrier says it's possible that a fist concentrates the force into a smaller area and so does more damage. Mary Marzke of Arizona State University in Tempe says the study is interesting, but it far from proves that the ability to make a strong fist was the main driver behind the evolution of our hands' shape. It is more likely that it was a useful side effect of a whole suite of modifications. She points out that apes strike with the heel of their hand when knocking fruit out of trees. Carrier's study didn't assess the force that the heel of the hand generates, but if it turns out to be as good as a fist, it becomes less clear that our hands evolved so as to be perfect for fist-making, Marzke says. But if the hypothesis is true, Carrier thinks it could explain another mystery. It has long been unclear why high levels of testosterone cause men's ring fingers to be longer than their index fingers. He says the finger-length ratio makes sense if it generates a better fist. This would make dominant males even better fighters. WELLINGTON: A US bid to extradite Megaupload boss Kim Dotcom from New Zealand for alleged online piracy has been delayed for a second time and will not be heard until August next year, his lawyers said on Thursday. The extradition case, launched after Dotcom's arrest in January for alleged online piracy, was originally due to go to court in August, then pushed back to March next year amid legal wrangling over evidence disclosure. A spokeswoman for Dotcom's Auckland-based barrister Paul Davison said the court had rescheduled the hearing again to August 2013. She did not provide a reason for the change. Police are investigating New Zealand's foreign intelligence agency, the Government Communications Security Bureau (GCSB), for illegally spying on Dotcom ahead of his arrest in a raid on his Auckland mansion in January. Prime Minister John Key earlier this year issued a public apology to Dotcom, acknowledging the German national should have been off-limits to the agency because he holds New Zealand residency. It was the latest in a string of setbacks for the case against Dotcom, who remains free on bail in New Zealand, including a court ruling that the search warrants used in the raid on his mansion were illegal. The 38-year-old's Megaupload file-sharing empire, which at its peak had 50 million daily visitors and accounted for four percent of all Internet traffic, was shut down after the raid and Dotcom has indicated he will seek damages. Dotcom denies US allegations the Megaupload sites netted more than $175 million in criminal proceeds and cost copyright owners more than $500 million by offering pirated copies of movies, TV shows and other content. The US Justice Department and FBI want Dotcom to face charges of racketeering fraud, money laundering and copyright theft in a US court, which could see him jailed for up to 20 years if convicted. WASHINGTON (AP) — Conservatives wanted Robert H. Bork on the Supreme Court. They wound up with Anthony Kennedy, the key vote in reaffirming a woman's right to an abortion. The fight over Bork's failed Supreme Court nomination redefined the Senate confirmation process and made him a symbol of the nation's culture wars. The political battle that erupted over Bork has now, years later, expanded to stall nominees for far lesser judicial posts, and nominees themselves have curbed their responses to questioning to avoid his fate. Had Bork, who died Wednesday at age 85, prevailed and become a justice, his vote would have dramatically changed the court. President Ronald Reagan's choice of Bork in 1987 to replace Justice Lewis Powell was intended to cement conservative control of the court for decades. And Bork gave both his supporters and opponents every reason to believe, through scholarly writings and judicial decisions, that he would be a consistent conservative vote on a range of key issues. That would include, perhaps most importantly, one day delivering the decisive blow to undo the 1973 Roe v. Wade ruling that declared a woman's right to an abortion. He was a staunch critic of the court's Griswold v. Connecticut decision in 1965 that found a right to privacy in the Constitution that trumped a state law prohibiting even married couples from using birth control. The ruling was a precursor to decisions in favor of abortion rights and gay rights, including some authored by Kennedy. In the mid-1980s, Bork was better known and had a much longer legal resume than his conservative colleague on the federal appeals court in Washington, Antonin Scalia. Bork had been a Yale law professor, whose students included Bill Clinton and Hillary Rodham. He was the Nixon administration's top Supreme Court lawyer and played a dramatic role in the Watergate scandal's Saturday Night Massacre. When Attorney General Eliot Richardson and his deputy, William Ruckelshaus, refused President Richard Nixon's order to fire Watergate special prosecutor Archibald Cox, Richardson resigned and Ruckelshaus was fired. The next in line at the Justice Department, Solicitor General Bork complied and earned the enmity of many Nixon opponents, although Richardson himself later praised Bork for his actions. Reagan went with Scalia, nine years younger than Bork and also the first Italian-American on the Supreme Court. With most attention focused on Rehnquist, Scalia sailed to confirmation through a Republican-controlled Senate. But by the time of Powell's retirement, a year later, control of the Senate had shifted to the Democrats and control of the court was at stake. On the same day Reagan said he would nominate Bork, Sen. Edward Kennedy rushed to the Senate floor to paint a vivid picture of Bork that enraged the White House and signaled the coming confirmation battle. "'Robert Bork's America is a land in which women would be forced into back-alley abortions, blacks would sit at segregated lunch counters, rogue police could break down citizens' doors in midnight raids, schoolchildren could not be taught about evolution, writers and artists could be censored at the whim of the government and the doors of the federal courts would be shut on the fingers of millions of citizens," Kennedy said. The Senate had scuttled four high court nominations in the 20 years before Bork's: two Democratic picks, Abe Fortas and Homer Thornberry, and two Republican ones, Clement F. Haynsworth Jr. and G. Harrold Carswell. But the fight over Bork was intensely partisan and ideological, and it reflected the high stakes in the Reagan administration's effort to push the federal judiciary to the right. The American Civil Liberties Union dropped more than a half-century of neutrality in confirmations to oppose Bork. Liberal interest groups mobilized in a precursor to what is now standard practice on both the left and right, to fight the nomination. Actor Gregory Peck recorded anti-Bork commercials. The Senate hearings were in one sense a televised civics lesson: Bork, a burly man with a heavy beard, repeatedly defended — in dry scholarly terms — his view that judges should play a limited role in American life. He faced sustained Democratic attacks on his writings in academia and on the federal bench. Among the topics up for discussion were Bork's views on civil rights. In 1963, he had written disapprovingly of the pending Civil Rights Act and called the government's effort to stop discrimination in restaurants, hotels and other areas of public accommodation "a principle of unsurpassed ugliness." Ten years later, in a hearing on his nomination to be Nixon's solicitor general, he said had been wrong about the civil rights legislation. Of the many Southern Democrats still in the Senate in 1986, by then dependent on significant African-American support at the polls, only Sen. Ernest Hollings of South Carolina voted for Bork. Edwin Meese, who was Reagan's attorney general at the time, was a leading proponent of counteracting what he saw as liberal judicial excesses, characterized most vividly by the Warren court, by making judges of people like Bork and Scalia. "The vicious opposition by the left to Bob Bork's nomination turned what had sometimes been a contentious confirmation process into literally a political campaign," Meese said Wednesday. The wrangling over nominees, once confined to the Supreme Court, now affects even candidates for district court judgeships. And nominees, looking back at Bork's performance, now routinely duck questions intended to elicit politically damaging responses that might provide a reason for senators of one party or the other, to cast "no" votes. The Senate eventually rejected Bork's nomination 58-42, with the help of a half-dozen Republicans who joined all but two Democrats in voting against him. In later years, Bork joked that he achieved a measure of immortality anyway, because his name became a verb signifying the vilification of a nominee on political grounds, as in, to Bork a nominee. After the Senate vote, the Reagan administration said it would nominate Douglas Ginsburg, but that choice faltered over Ginsburg's admission that he had smoked marijuana while a professor at Harvard Law School. He withdrew and the White House put up Kennedy, who was confirmed without a dissenting vote and whose ongoing role as the swing vote in many of the cases that split the justices on ideological grounds remains a source of consternation among conservatives. EDITOR'S NOTE — Mark Sherman has covered the Supreme Court for The Associated Press since 2006. A picture is worth a thousand words—or in the case of bats, a rabies diagnosis. A new study reveals that rabid bats have cooler faces compared to uninfected colony-mates. And researchers are hopeful that thermal scans of bat faces could improve rabies surveillance in wild colonies, preventing outbreaks that introduce infections into other animals—including humans. Rabies, typically transmitted in saliva, targets the brain and is almost always fatal in animals and people if left untreated. No current tests detect rabies in live animals—only brain tissue analysis is accurate. Searching for a way to detect the virus in bats before the animals died, rabies specialist James Ellison and his colleagues at the CDC turned to a captive colony of big brown bats (Eptesicus fuscus). Previous studies had found temperature increases in the noses of rabid raccoons, so the team expected to see similar results with bats. Researchers established normal temperature ranges for E. fuscus—the bat species most commonly sent for rabies testing—then injected 24 individuals with the virus. The 21-day study monitored facial temperatures with infrared cameras, and 13 of the 21 bats that developed rabies showed temperature drops of more than 4ºC. Although thermal scans didn't catch every instance of rabies in the colony, this method may be a way to detect the virus in bats before symptoms appear. The team plans to fine-tune their measurements of facial temperatures, and then Ellison hopes to try surveillance in the field. This study was published online November 9 in Zoonoses and Public Health. Scammers may be looking to cash in on the public's generosity following the Sandy Hook massacre, the Better Business Bureau warned. "It is a challenge to be on guard because public sympathy and emotions are running high," said Bennett Weiner, chief operating officer of the BBB Wise Giving Alliance, a group that helps charitable donors make informed decisions. Weiner said it's difficult for scams to be detected in the first week following every national tragedy, however he suspects unscrupulous people are already out there, eager to cash in on the massacre. False websites or phone calls soliciting help for the victims' families are two of the easiest and most common scams Weiner said he sees. "They're hard to identify because people don't know they've been taken and they're not going to know until down the road," he said. After the Sandy Hook massacre, countless Facebook pages for the victims, listings on crowdfunding sites and community drives have been established to solicit donations. While many of them may be legitimate, Weiner warns people to do their research. "You really have to be watching out for newly created things. There may be some well-intended effort, but you have no way to look at their track record," he said. "I can tell you from experience there are some cautions associated with it." Any fundraising effort that makes vague statements, such as "we're going to help the victims and families," is another red flag to watch out for, Weiner said. Whether it's fundraising for the Aurora theater victims or a local terminally ill child, Weiner said the BBB sees these kinds of scams "time and time again" and actively investigates them. "It is a challenge to be on guard after a tragedy," he said. "But you shouldn't give to any organization without checking them out first." NEW YORK: The euro pushed higher against the dollar Tuesday, helped by improvements in Greece's financial status and a Spanish debt sale, and as Washington continued to battle over the looming fiscal cliff. Meanwhile the yen slipped to its lowest level since April 2011 as Japan's incoming prime minister pressed the central bank for more stimulus. The euro reached its best level since the beginning of May, ending at $1.3225 at 2300 GMT, up from $1.3161 late Monday. The seven-month high for the euro came "on the back of successful sales of Greek and Spanish bills," said Benjamin Spier of Daily FX. "Spain sold 3-month and 6-month bills for 3.52 billion euros, better than the maximum target of 3.5 billion euros. Greece sold 13-week treasury bills for 1.3 billion euros at a 4.11 percent yield," he said. Shortly afterward, Greece's credit rating was upgraded by Standard & Poor's from "selective default" to B-, with a stable outlook, following Athens' debt buyback that earned it fiscal breathing space and new bailout funds releases from the eurozone. The upgrade "reflects our view of the strong determination of European Economic and Monetary Union (eurozone) member states to preserve Greek membership in the eurozone," S&P said. Meanwhile, the dollar got no help from Washington politicians, who have not yet reached a deal on a long-term deficit reduction plan that would also help the country avoid crunching tax hikes and spending cuts slated for January 1. The yen continued to fall, setting 20-month lows against the dollar and euro, two days after the Liberal Democratic Party swept to a general election victory that is returning Shinzo Abe to the premiership. Abe met with Bank of Japan governor Masaaki Shirakawa at his party's headquarters Tuesday and told the central banker he wanted to set a two percent inflation target, in the opening salvo of his battle to kickstart the economy. "I told him I want to reach a policy accord with the BoJ for the two percent inflation target that I promoted throughout the election campaign," Abe told reporters. In other currencies, the dollar slipped to 0.9134 Swiss francs, while the pound gained to $1.6247. WASHINGTON (AP) — Just two weeks from an economy-threatening deadline, fiscal cliff talks hit a lull Tuesday as House Speaker John Boehner announced that Republicans would also march ahead with their own tax plan on a separate track from the one he's been pursuing with President Barack Obama. The White House and leading congressional Democrats immediately rejected Boehner's "Plan B," which would extend soon-to-expire Bush-era tax cuts for everyone making less than $1 million but would not address huge across-the-board spending cuts that are set to strike the Pentagon and domestic programs next year. "Instead of making tough choices today House Republicans are threatening to abandon serious negotiations," said Senate Majority Leader Harry Reid, D-Nev.
Reid added: "Everyone should understand Boehner's proposal will not pass the Senate." Boehner's surprise move came after significant progress over the past several days in talks with Obama — talks that produced movement on tax rate hikes that have proven deeply unsettling to GOP conservatives and on cuts to Social Security benefits that have incensed liberal Democrats. Just Monday, Obama offered concessions, including a plan to raise top tax rates on households earning more than $400,000 instead of the $250,000 threshold he had campaigned on. And the two sides had inched closer on the total amount of tax revenue required to seal the agreement. Obama now would settle for $1.2 trillion over the coming decade while Boehner is offering $1 trillion. By contrast, protecting income below $1 million from a hike in the top tax rate from 35 percent to 39.6 percent would raise only $269 billion over the coming decade. But the outlines of a possible Obama-Boehner agreement appeared to have shaky support at best from Boehner's leadership team and outright opposition from key Republicans like vice presidential nominee Paul Ryan, R-Wis., a House GOP aide said. That aide spoke only on condition of anonymity because the aide was not authorized to discuss the situation publicly. Though Obama spokesman Jay Carney had nothing good to say about Boehner's new option, he said, "The president is willing to continue to work with Republicans" toward a broader agreement. The narrower Plan B faced plenty of opposition. Democrats announced they would oppose it, and many conservative Republicans continued to resist any vote that might be interpreted as raising taxes. Republicans were refining the measure Tuesday in hopes of building support among the GOP rank and file, but passing the measure exclusively with GOP votes could prove difficult. "I think it's a terrible idea," said Rep. Raul Labrador, R-Idaho. "For a lot of reasons." Democrats said Boehner's move made it clear he was abandoning efforts to reach an agreement with Obama — much as he quit talks with Obama 18 months ago. "Plan B is yet another example of House Republicans walking away from negotiations," said Rep. Chris Van Hollen, D-Md., top Democrat on the Budget Committee. Boehner, however, said Obama is the one proving to be too inflexible, even as he held out hope that talks with Obama might yet bear fruit. "He talked about a 'balanced' approach on the campaign trail," Boehner said. "What the White House offered yesterday — $1.3 trillion in revenue for only $850 billion in spending cuts — cannot be considered balanced." Just Monday, the Capitol bristled with optimism that Boehner and Obama might strike a bargain. In a new offer, Obama dropped his long-held insistence that taxes rise on individuals earning more than $200,000 and families making more than $250,000. He is now offering a new threshold of $400,000 and lowering his 10-year tax revenue goals from the $1.6 trillion he originally sought. The new Obama plan seeks $1.2 trillion in revenue over 10 years and $1.2 trillion in 10-year spending reductions. Boehner aides say the revenue is closer to $1.3 trillion if revenue triggered by a new inflation index is counted, and they say the spending reductions are closer to $930 billion if one discounts about $290 billion in lower estimated debt interest. The two sides also differ on the estate tax, extending unemployment benefits and how to address the need to raise the government's borrowing cap to prevent a first-ever U.S. default and a re-run of last year's debt crisis. The White House was facing its own backlash, with labor, liberal and elderly advocacy groups mounting an organized campaign against any adjustments in cost-of-living for Social Security beneficiaries. "President Obama and other Democrats campaigned saying Social Security doesn't affect the deficit," said Roger Hickey, co-director of the liberal Campaign for America's Future. "Social Security recipients are going to notice and they are either going to blame John Boehner or President Obama." The change would reduce annual cost-of-living increases for beneficiaries of Social Security and other government programs. It also would push more people into higher tax brackets by making smaller annual adjustments to brackets. The administration appeared confident that most Democrats would reluctantly vote for the idea in an attractive enough budget package. White House spokesman Carney described the inclusion of the inflation adjustment as "a technical change" that was "not directed at one particular program." He also said that if instituted, the administration would ensure that the most vulnerable beneficiaries would not be affected. "As part of an effort to find common ground, with the Republicans, the president has agreed to put this in his proposal," Carney said. Associated Press writers Alan Fram, Jim Kuhnhenn and Donna Cassata contributed to this report. A Geminid meteor streaks across the sky above the beach in Ocean City, New Jersey, in a picture taken December 14. The piles come from sand blown onto city streets during Hurricane Sandy. The annual Geminid meteor shower, which peaked last weekend, usually produces dozens of shooting stars per hour—making it one of the strongest and most reliable celestial shows around. Ten meteors on seven different frames combined to show the radiant—the point in the sky from which the Geminid meteors appear to originate. The picture was taken December 14 in Yosemite Valley, California. A Geminid meteor zooms over a barn in Saukville, Wisconsin, on December 14. Historically the Geminids were overlooked by most amateur astronomers simply because the annual event occurs so close to the busy holiday season and frigid winter nights—but that's beginning to change thanks to its rising intensity over the past few decades. Israelis relax in a hot spring near the Dead Sea during the peak of the Geminid meteor shower in a long-exposure photograph taken December 14. Since Geminids hit the atmosphere at about 20 miles per second (32 kilometers per second)—slower than other meteor showers—they create beautiful long arcs across the sky that can last for a second or two. Geminids slice the sky over a glittering Aspen, Colorado, in a picture taken December 14. Geminid meteors appear to radiate from the shower's namesake constellation, Gemini, the twins from Greek legend. A Geminid shoots over the Hurricane Sandy-damaged remains of the 59th Street Pier in Ocean City, New Jersey, on December 14. Geminid meteors light the sky over Borgarnes, Iceland, on December 15. "There were so many of them," said photographer Sunna Gautadottir, "and it was just way too beautiful to describe in words."